She was riding pillion and found it difficult to hold the wheelchair, I had then kept it at the foot rest only for it to bounce off when I braked at a railway crossing. To our dismay and surprise it was on road moving as one with other vehicles. My sister got off the scooter, grabbed it and took it in an auto. We finally arrived at the temple by car, scooter and auto. 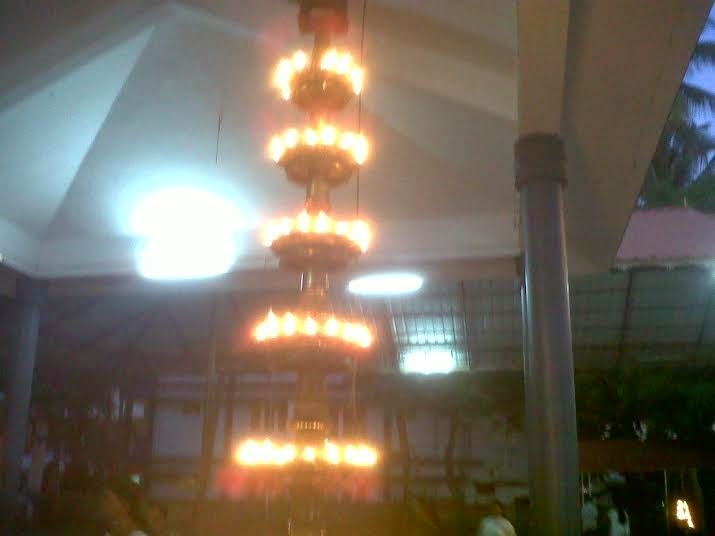 One of the local temples in Ernakulam. 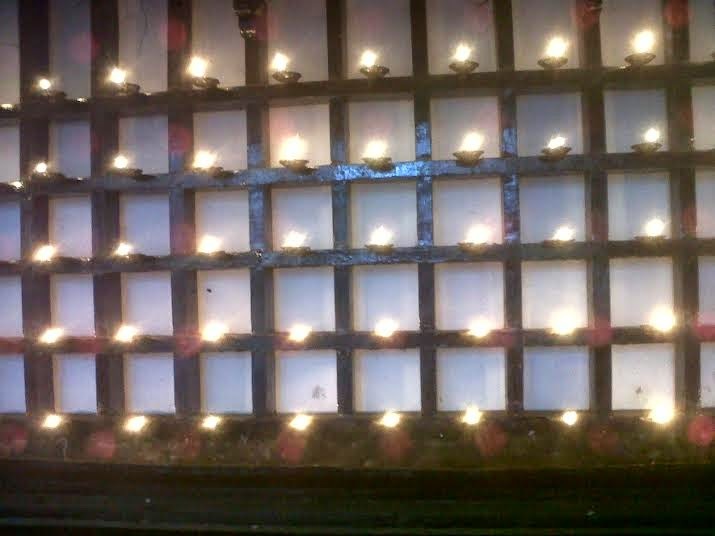 Almost all of then had lit these stunning surrounding lamps during our visits. Other visits to local temples were peaceful and relatively free of adventures. Gaining confidence and aiming higher we took him to Chottanikkara Bhagavathy Amman temple. We miscalculated a couple of things – one, the annual Sabarimala season had started and Ayyappas in thousands descended on the temple; two, we had no Malayalam speakers with out; three, wheelchairs weren’t allowed in front of Bhagavathy amman. 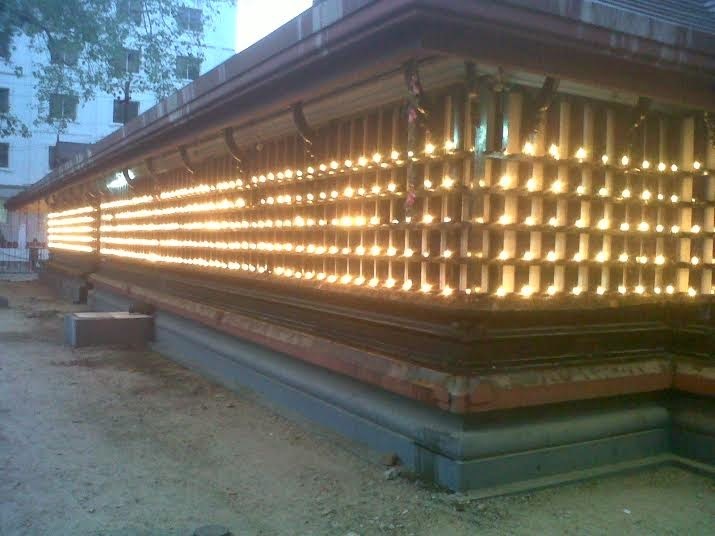 Authorities asked us to circumambulate the temple and leave without seeing the presiding deity. Wheelchairs apparently are vehicles and cannot be allowed in the inner sanctum. There were only two ways he could go in - he either walks or someone physically carries him. Not to let go easily after all trouble of bringing him thus far, we obviously decided to carry him. Our driver was the first happy and willing volunteer and I found a second after some scrambling. Just as we were about to lift our father off the wheelchair the manager noticed the urine bag and literally freaked out. Without letting him to lose it any further and not giving him a moment to think I rapidly pleaded in Tamil interspersing liberally with ‘Please’ in English and some random Malayalam words. I think it was mainly to get me to stop talking and free himself from the bunch, he agreed, but we had to make it real fast. Appa had a lovely darshan in less than 2 minutes. We left mighty pleased. My brother-in-law later mentioned that temple would be closed if any infant passed urine in the main shrine. I was glad we didn’t create that havoc. When we went to other famous temples we were prepared for some weight lifting, the urine catheter and bag were hidden out of site, and there were no more surprises. In the stunning Kodungallur BhagavathyAmman temple, it was the nurse, driver and myself who did the lifting. In the awe inspiring Vaikkom Shiva temple, it was our driver and a good Samaritan. In famed Thiruvanchikulam Mahadeva temple, to our delight and relief, we were allowed to roam carefree with the wheelchair. Friends and relatives ask if Appa realized he was at these temples and if he knew what went into taking him to each. I think he did, but that's of least consequence. We were seeking neither his appreciation nor blessings from God, but merely offering our gratitude.